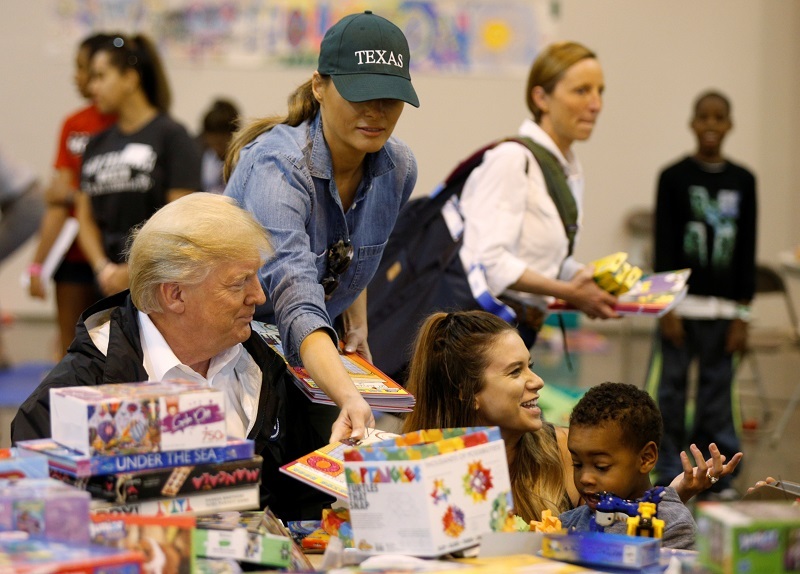 President Donald Trump and first lady Melania Trump visited Texas as it struggles with the aftermath of Hurricane Harvey. 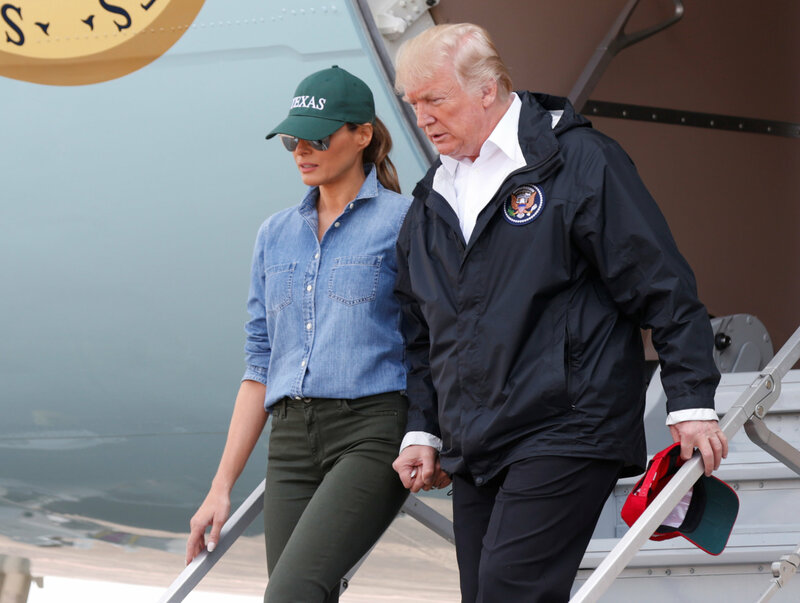 In the first stop of their second visit to Texas this week, the president and the first lady spent nearly 45 minutes at the NRG convention center meeting with people affected by the disaster. The two, who were accompanied by Texas Gov. Greg Abbott and several members of Trump’s cabinet, were warmly received, with many hugs and handshakes and photos and selfies. At the “kid zone” in the convention center, they met with young children affected by the storm and their parents. 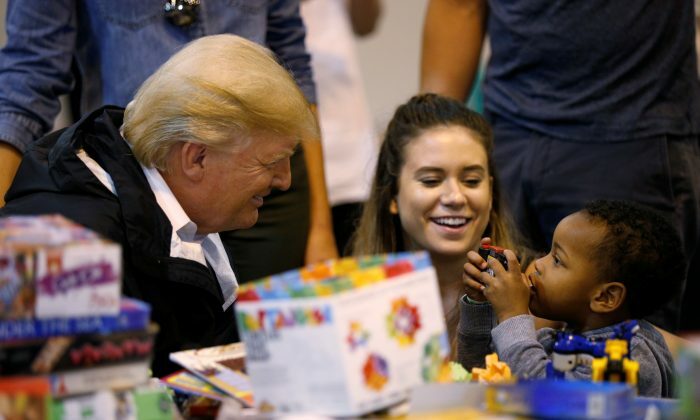 The president took some time to play with some of the children and talk with their parents. 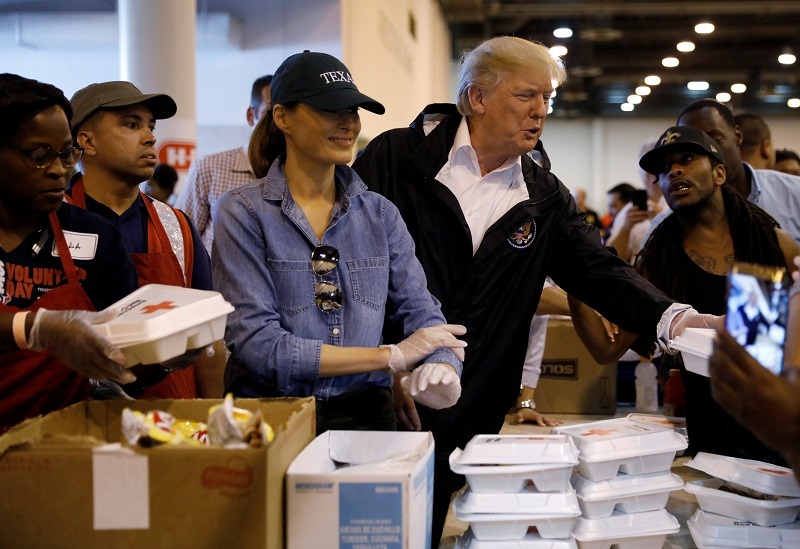 The president and first lady also helped to hand out food to Harvey survivors, with many people wanting to shake hands and take selfies with the president. “I’m a Democrat. It raises the morale … This shows a lot of support,” said Kevin Jason Hipolito, 37, at the convention center. The hurricane and the floodwaters it dumped displaced over one million people and is feared to have killed 50 people. 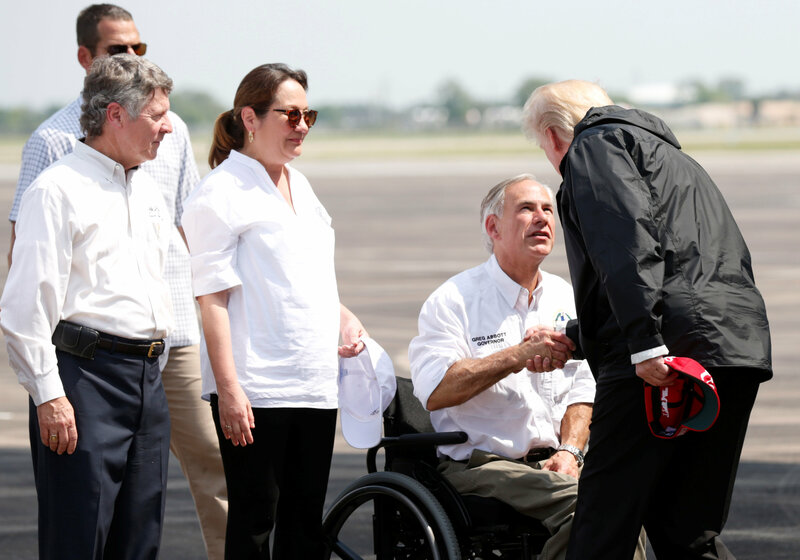 On the same day as his visit to Texas, the White House announced that the Trump administration was making additional disaster assistance available to Texas. By amending the disaster declaration Trump signed earlier in the week, levels of federal funding for debris removal and protective measures as a result of Hurricane Harvey will be increased. 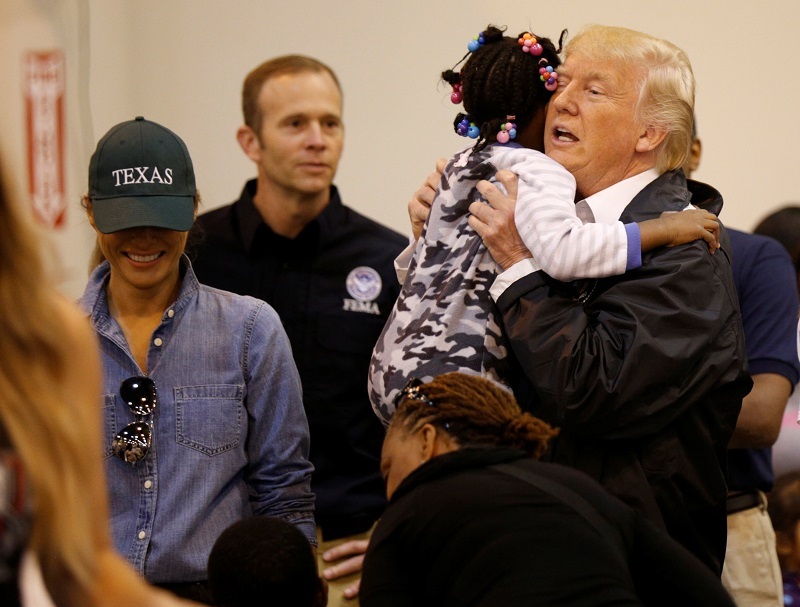 During a visit to the First Church of Pearland in the Houston suburb of Pearland, President Trump praised Gov. Abbott for his work. “I want to congratulate the governor. I want to congratulate everybody that’s worked so hard,” Trump said. 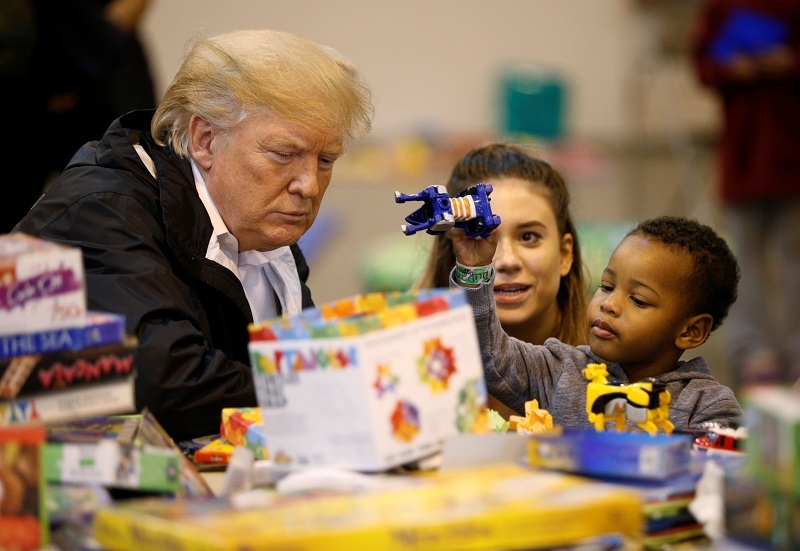 Trump reminded those in the church that he had signed a proclamation declaring Sunday Sept. 3 as a National Day of Prayer in response to the natural disaster. “So many of you are faith based and I want to just tell you that tomorrow we have national prayer day .. Tomorrow’s a very big day, so go to your church and pray and enjoy the day,” he said. “Him being here and bringing global attention to everything that’s going on here, he brings up prayers from around the world,” she said. Ybarra had come to the church to volunteer to help storm victims. Although there had been bad flooding on her street in the Pearland neighborhood, her home had not been damaged. “It just really showcases the efforts of the United States and the community,” she said. Kenny Mercado, senior VP at electricity provider CenterPoint Energy, was among the volunteers. “It’s wonderful to see. It’s a tough time. It [Trump’s visit] brings spirit, brings hope. This is a city that got a long, long, long journey ahead. There’s still a lot of work to be done,” he said. 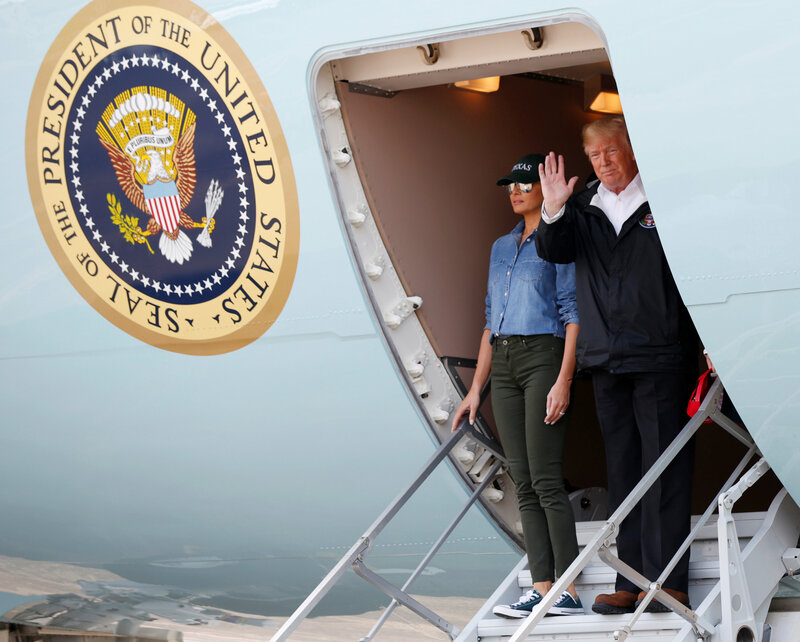 The president and the first lady also witnessed the destruction of homes firsthand. 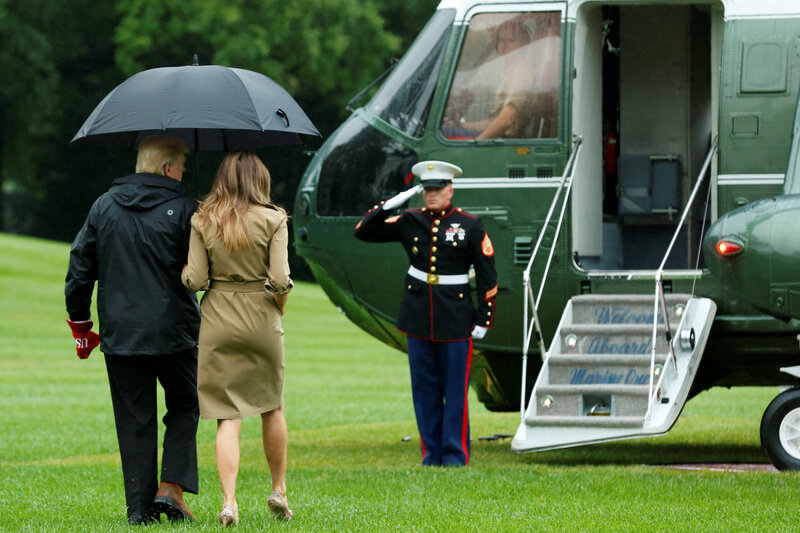 Their motorcade stopped in a neighborhood of Houston, just outside of Pearland, where trash bags and other debris had been piled up high in front of ranch style homes. A man wearing a red “Trump is my president” T-shirt came over and was invited by the President for a photo. “You’re going to be famous now,” he said encouraging the man to take off his sunglasses, which revealed a pierced left eyebrow.